Doing laundry-you either love it or you hate it…well, let’s get real, we all hate it. But, that doesn’t mean we need to hate the laundry room. As explained in our last blog post, the function of a room is significant, but that doesn’t mean you can’t get creative + have a little fun with it! What better way to motivate you to get laundry done?! Today, we came up with a few tips + tricks to make those dreaded chores feel a little less dreadful. An important element in any laundry room is a folding station. A folding station can make even the tiniest laundry room look decluttered, and is a complete space-saver! 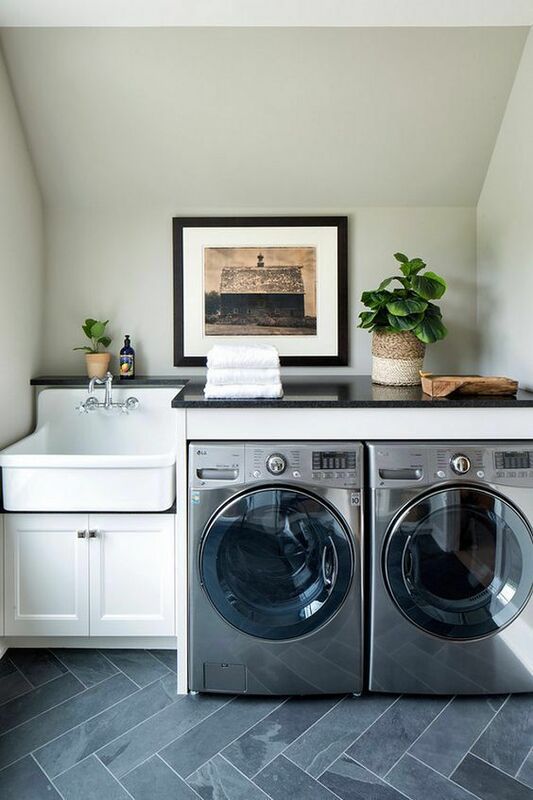 There are ways to create a folding station in your laundry room by creating extra counter space, you can purchase one online for reasonable prices, or you can make it into a fun DIY project! Because this is such a smaller and private space, the perfect opportunity to play around with textures and patterns is created! Using fun or dramatic wallpaper is a great way to give this space a little personality! Also, adding wall art can help to tie in the style of your home. The function of the laundry room can be made creative by adding decorative storage! Using baskets and glass jars for detergent and softener are great ways to add a hint of organization and elegance to your laundry room storage space. Accessorizing with greenery and fun vases can transform a laundry room into a light and unique space. Adding a creative tile to create a backsplash, or even adding it to a smaller floor space can make this room truly stand out and add character! As far as paint goes, creating a space with lighter paint tones can make even the smallest room feel larger and brighter. Stay tuned to see inspo + photos for this week's theme on our Pinterest page! And check out last weeks Tips & Tricks on bathroom ideas here!